After the buzz at yesterdays 2019 International Year of Indigenous Languages 50c coin launch it was great to once again trek into Adelaide City with my guide dog in training Pupstar Tully. Having to rely on public transport we arrived in Rundle Mall well prepared with the idea that we’d be carrying home a lot of change! Having planned for a fair bit of waiting in a queue we were surprised to find the best scenario of a no-wait queue! I’m told the crowd and long wait had been and gone since opening at 8am when we arrived around 9:30. This made for quite an easy “get to the end of the line” pirouette to purchase or rather swap cash for coins. Royal Australian Mint (RAM) happy friendly staff had both new commemorative coins available, the 2019 International Year of Indigenous languages 50c and the 2019 100 years of Repatriation red coloured $2 coin. All in $10 sachets limits at the time were 10 each per person per lineup (or pirouette). The RAM pop-up shop was conveniently located directly opposite the Commonwealth Bank with it’s 5 ATM’s, how appropriate. After we’d made our swaps we returned home myself now the packhorse. Back home just in time for morning tea! 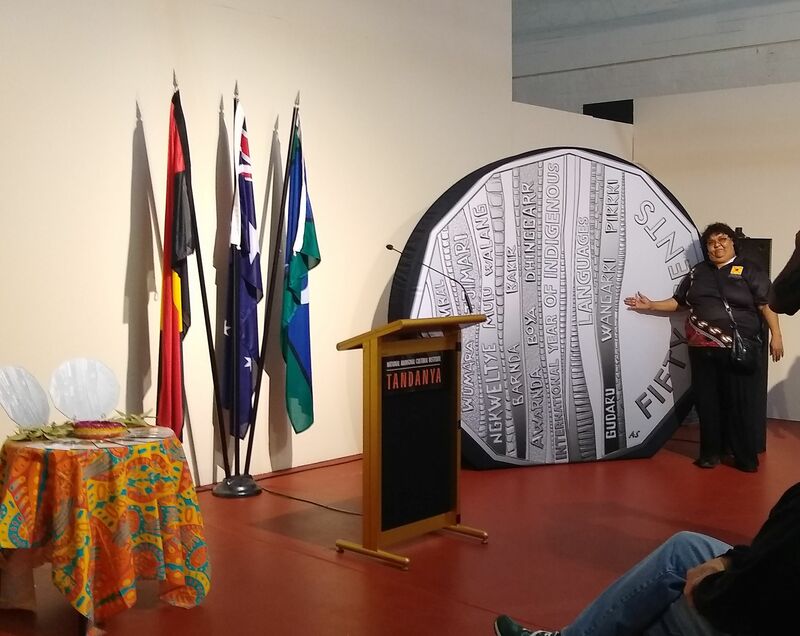 Today in the Tandanya National Aboriginal Cultural Institute in the centre of Adelaide I was invited to attend the launch of this hot off the press commemorative 50 cent coin. This coin struck by the Royal Australian Mint celebrates 2019 as the International Year of Indigenous Languages and this Australian coin design incorporates 14 different translations of the word coin or money in the indigenous languages spoken by these groups around the country. Designed by the Mints own Aleksandra Stokic the 50 cent can be found in circulation, can be purchased in frosted unc in a card or fine silver proof. The obverse features the IRB (Ian Rank-Broadley) portrait of the Queen. 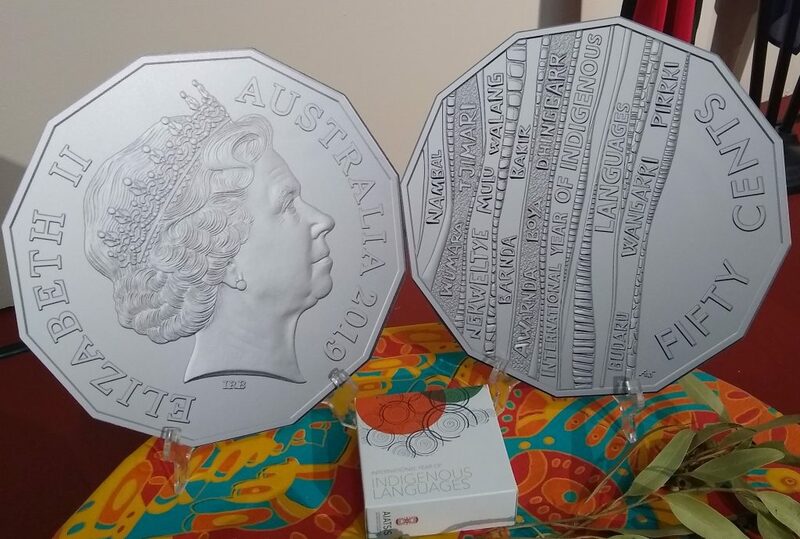 Unveiling the coin is probably not the right word as Mint CEO Ross MacDiarmid announced the new release speaking next to a giant 50 cent piece -quite the centrepiece and a bit too hard to hide. The highlight was local Kaurna man Jack Buckskin who spoke with his gorgeous children by his side just a little too starstruck to dance. We clapped the entertainment just the same. Jacks boys were sweethearts. 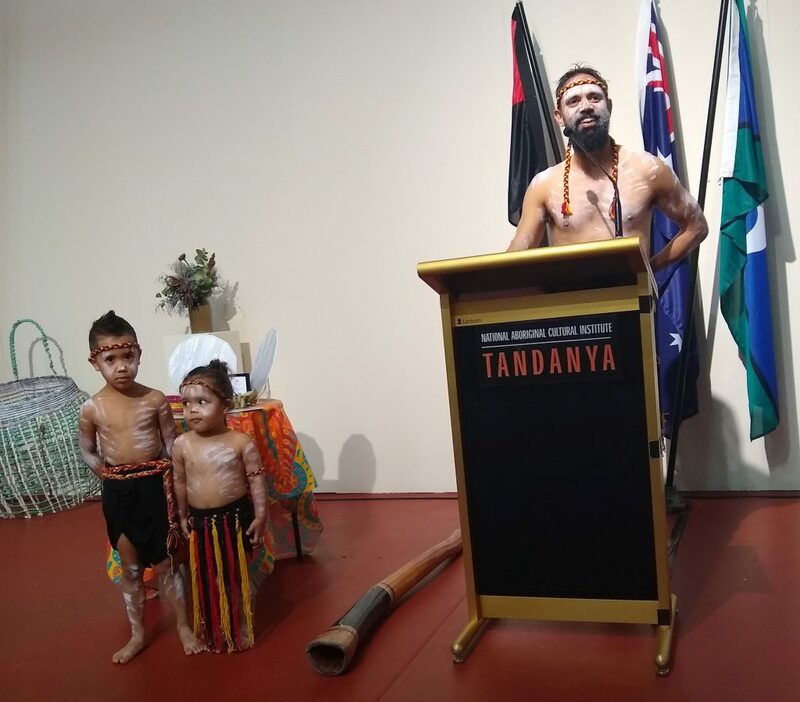 Opening our eyes to the broad and diverse languages was speaker Professor Jaky Troy, a Ngarigu woman from the Snowy Mountains where I myself grew up. Being a UNESCO declared year of Indigenous Languages chair of this steering committee and AIATSIS (Australian Institute of Aboriginal and Torres Strait Islander Studies) CEO Craig Ritchie also spoke today. Following the formalities was a delicious offering of finger sandwiches and delightful sweet snacks next to the gallery we could then browse. Did someone say coin swap…..where….when….and more importantly what? 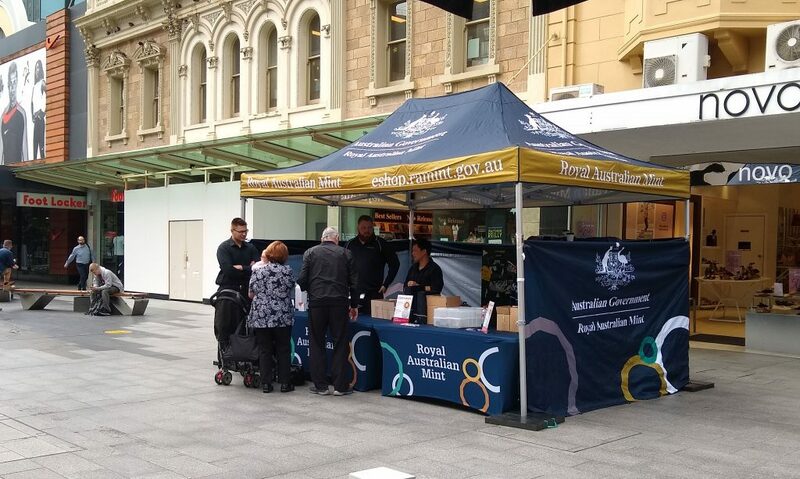 The Royal Australian Mint are having coin swap events this Wednesday in many major capital cities. Swap (cash only) money in your wallet or purse for new money, the latest circulating coins at the locations detailed below. New releases, still under media lockdown (at the time this article was written, see images above added later) include a new 50c being officially launched on Tuesday and a coloured $2 coin with vague details this will all become clearer soon. Always innovative The Royal Australian Mint has just announced the worlds first self inflationary coin to be struck today! The coins are as thick as the two dollar coin, but slightly larger than the dollar coin. The new coin will be a five dollar denomination and made in a new composition of hardened soap. A spokesperson for the Mint is reported to say during the long hot Aussie summer inflation should be as slow as a Koala. But in the tropical wet and West Australian winters the inflation might be faster, perhaps as fast as Goanna on fire! The coins will be taken out of circulation when they reach a value of ten dollars. Health departments in all states are happy with the innovation, saying “its a ripper bonus as the hygiene of the nation will improve as cleaner transactions appear everywhere, besides we will all have clean hands!” The numismatic community are awash with anticipation for this release, check the Royal Australian Mint website for details of how to get your hands on this new coin release. A new coloured coin series featuring Mr Squiggle and his friends will appear in Woolworths supermarkets from February 13th. The man from the moon with a pencil for a nose Mr Squiggle will feature on the first coloured 2 dollar coin appearing in change in the same fashion as the Commonwealth Games coins did last year. Over 4 weeks Woolworths will release into circulation four coloured $2 coins with the help of Armaguard and the Royal Australian Mint. The first of Mr Squiggle himself, followed by Bill (the Steam Shovel), Gus (the Snail) and Blackboard. A complete collection set can also be purchased featuring these 4 coins as well as two special 60 years of Mr Squiggle one dollar coins and a flying rocket 1 cent coin. A sneaky snippet appeared in this weeks Woolworths catalogue to build some excitement! 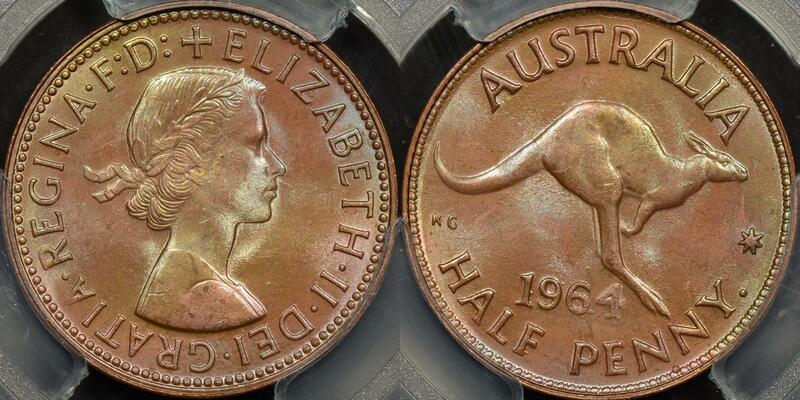 Above you can see a simply amazing error, an Australian 1947 Florin struck on an ellipse shaped planchet. The shape of the coin is the result of a coin blank that was struck twice by the blanking press, the smaller crescent shaped segment falling off leaving the distinctive elliptical shape. That blank is then struck and we have the error we see before us. We written extensively about how elliptical clipped errors occur previously. If you take the time to read the article we’ve just linked to you’ll note that we call this error the ‘rarest’ of the clipped planchet errors. 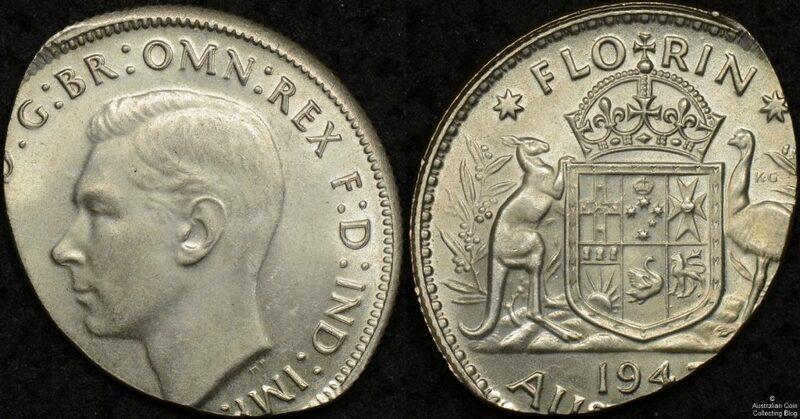 We stick by that claim, and suggest that an elliptically clipped florin is scarcer again, and one with such a nice grade as this 1947 example even scarcer! In fact, the authors can recall seeing less than 5 elliptical clipped florins, including this 1962 example we wrote about earlier this year. That 1962 elliptical clip florin is not so nearly as nice as the example we’re looking at here and this just highlights how it is a truly wonderful and hard to get error. One that if seen and not purchased is unlikely to be replaced by another example in a short time frame. This coin was obtained from a Noble Auction where it realised about $1000 including buyer’s premium. There might be some reading this who look at this coin and wonder how we can tell that the coin blank was elliptical BEFORE the coin was struck rather than a normal coin being cut down AFTER it was struck. We covered that in some detail when we looked at the 1962 example but to summarise, look for two key indicators. The first, is fishtailing of the legends near the missing part of the coin, in this case it could not be more obvious than on the D of D.G. on the obverse of the coin. The second indicator is poorly struck rim beads/denticles and rims near the clipped region that transition into fully struck further away from the clip. This is very clear on the reverse of the coin above the N of FLORIN. We’ll conclude the same way we did the last time we looked at a florin struck on an underweight elliptical planchet by saying that it’s always fun to be able to take a closer look at such an impressive error. Coin Fair! Coin Fair! Coin Fair! 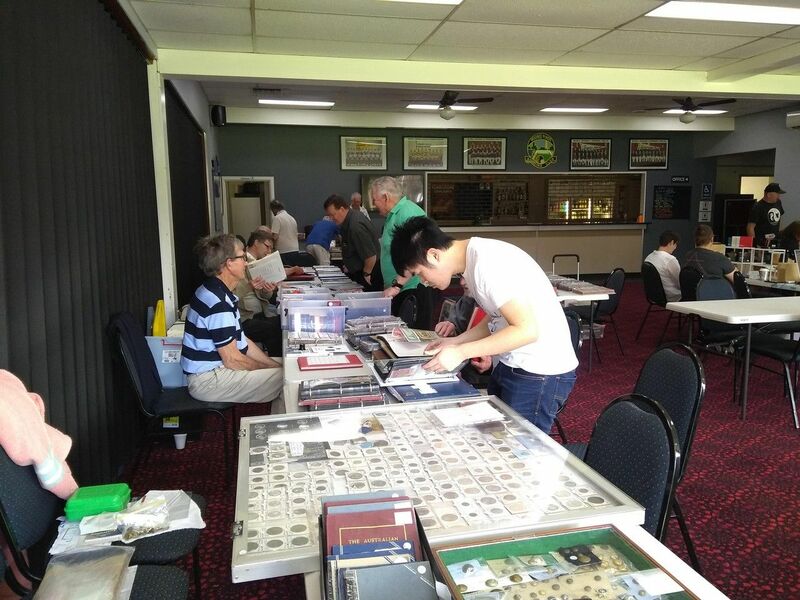 Who doesn’t like a coin fair. Not us, we love them. Especially when they are coin fairs you attend almost by accident when you’re on holidays. 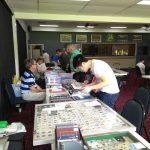 On the first Sunday of each month the Northern Suburbs Coin and Stamp Fair is held at the Moonee Ponds Bowling Club in Moonee Ponds. 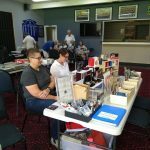 Open from 9AM to 2PM the fair is organised by Steele Waterman of S&T Collectables. 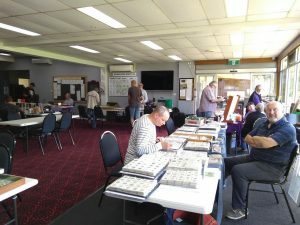 It has grown from from a single coin dealer event to what it is now, a monthly show with 5-10 local dealers in attendance. On Sunday the 6th of January 2019 we caught the Craigieburn Line train from Flinders Street Station in Melbourne and after 10 minutes we got off at Moonee Ponds Station. 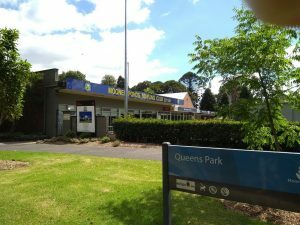 It was a 10 minute walk to Queens Park. On one side of Queens Park is the Moonee Ponds Bowling Club where the fair is held. 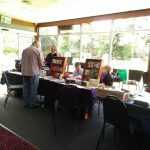 The room was well laid out with dealers lining each wall and couple in the middle of the room. Along the back of the room was the bowling club bar just in case you get thirsty! A Grinning Steele Waterman (right) Welcomes us! Steele’s table was right by the entrance and he greeted each person entering in his usual jovial fashion. 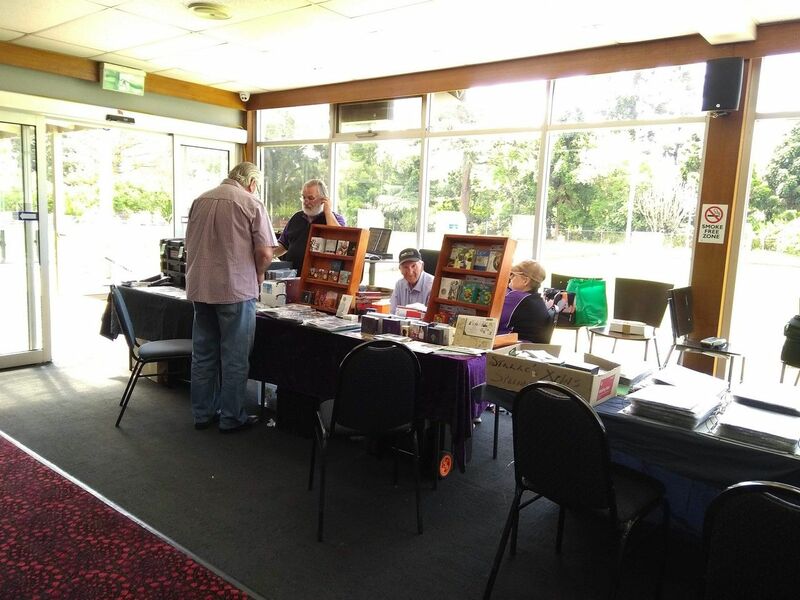 Those selling and buying coins were locals, including Comm Coinage, various members of the Numismatic Association of Victoria, members of the Geelong Numismatic Society, Neil the Coin Enthusiast (we kid you not), and a couple of others whose names we didn’t catch. You can see images of the room below. There was an eclectic mix of material at the show. 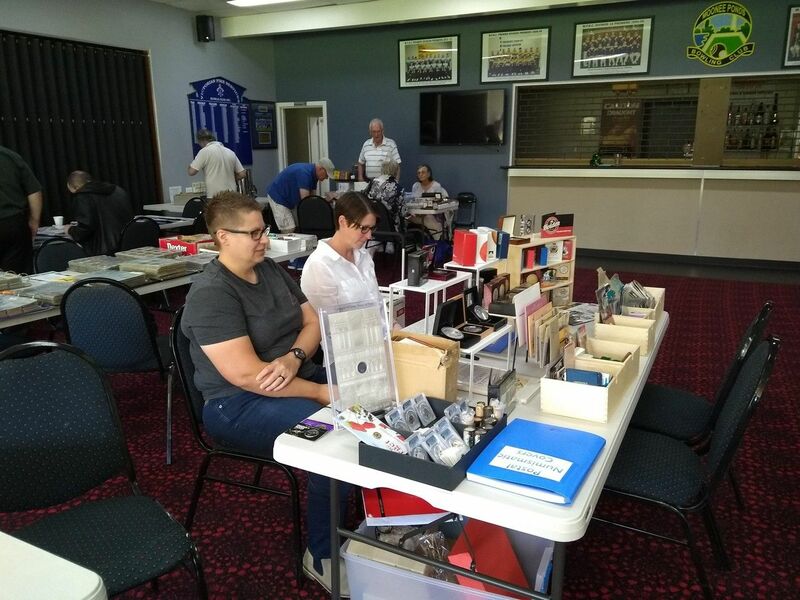 Items of interest we saw included a book on polymer notes we’ve not seen before, a lovely collection of Australian pre-decimal coins that had obviously been put together with care, Steele Waterman’s usual HUGE array of world coins, and some nice PCGS graded $2 coins. 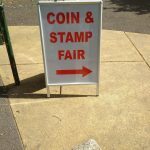 Of course it was (and always is) fun to talk to other coin collectors and that was probably the highlight of the day. That and the icy cold can of Solo from the bar and the leisurely walk around the lake out the back of the bowling club once we were done. If you’re a coin collector looking for something to do on the first Sunday of every month then take the trip out to Moonee Ponds to the Northern Suburbs Coin and Stamp Fair. Admission is free, the venue is nice, and it’s super easy to get to. What’s not to like? Stuck for Christmas gift ideas? Eric Eigner from Drake Sterling Numismatics knows what a great gift a coin is for Christmas. 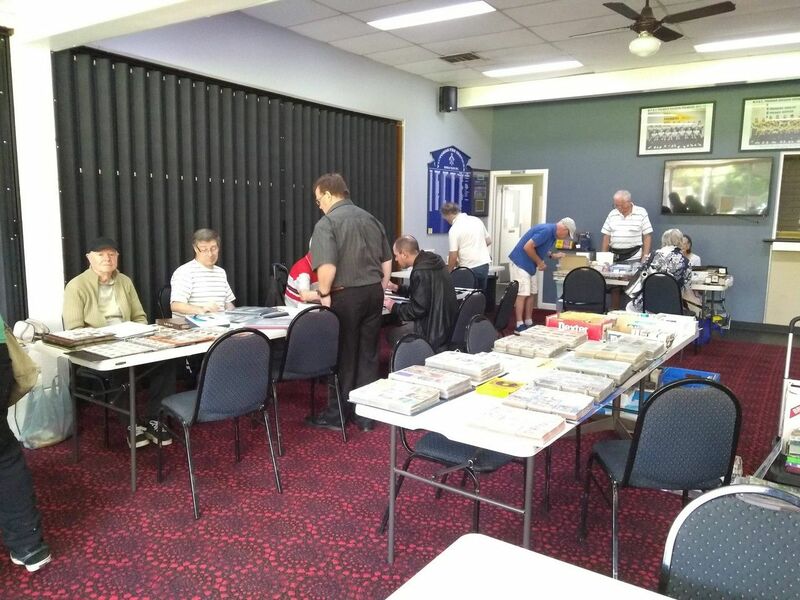 He says in this news article published by The Sydney Morning Herald today that younger collectors, older collectors and those in between are increasingly spending their disposable income on coins. This means a coin for Christmas could be the best present idea you’ve had yet. Perhaps it’s a coin from their year of birth, or from a special anniversary, a country they’ve visited or a theme that touches their heart -there’s most likely a coin that would be a great gift this festive season. Certified coins such as those graded and encapsulated by PCGS are increasingly sought after, an easy buy for those flocking to online shops to buy this Christmas (PCGS Coins on eBay ). For the young, a coin for Christmas can spark an interest that will last a lifetime. And who doesn’t like spending money and getting money in return, what a great investment! So if you’re stuck for ideas for Christmas presents this year be sure to buy that special someone a coin for under the tree. As a follow on to the entries about clipped planchet coin errors we’ve decided to put up a post on the double curved clip coin error. You can see an example of this sort of coin error above. This 1981 5 cent exhibits two distinct curved planchet clips at 90 degrees from each other. These errors are a lot more unusual than the single curved clip coin errors and for some denominations from some countries are almost non existent. 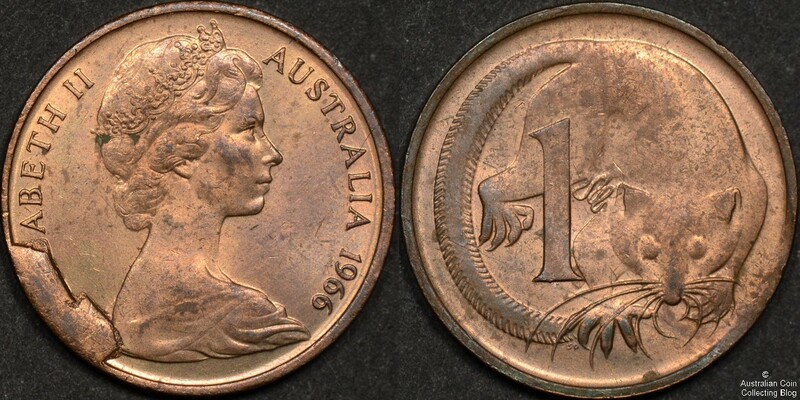 We’ve seen less than a couple of dozen double clipped Australian coins in the last 10 years. Given their scarcity we feel they are an undervalued error and we’d recommend picking them up where you can. To give you an idea of how these errors occur please take a look at the diagram above. Typically coin blanks are punched from a metal strip in rows. The rows are usually offset from each other (like the courses of bricks on a house) to more fully utilize the metal in the strip. In the example above the first row of blanks has been punched out correctly. However, for due to some material feeding fault or machine error the metal strip has moved from where it should have been punched so that coin blank 3 is punched out of an area that already had coin blanks 1 and 2 punched from it. This results in 2 curved clips on coin blank 3. There are many variations on this sort of clip. The picture of the 5 cent coin above probably happened because of something like that show above as the curved clips are 90 degrees apart.. The so called coin cud or die chip error coin happens when a part of one of the dies that strikes the coin actually breaks off. When this broken die strikes a coin the result is a new raised feature (usually looking like a blob) on the surface of the struck coin. The blob mirrors the incuse feature on the die where the die broke. Coin cuds or die chip errors are reasonably common, and unless the cud is particularly large usually only worth a small premium. A lot of the US Morgan Dollar VAM’s are defined by cuds or die breaks and these can often carry a larger premium over the non variety coins. The most common form of coin cud error is the rim cud, where part of the die that forms the rim of the coin breaks away and any struck coins have a raised element that extends around part of the rim. You can see this type of cud on the coin in the image shown at the start of this article. 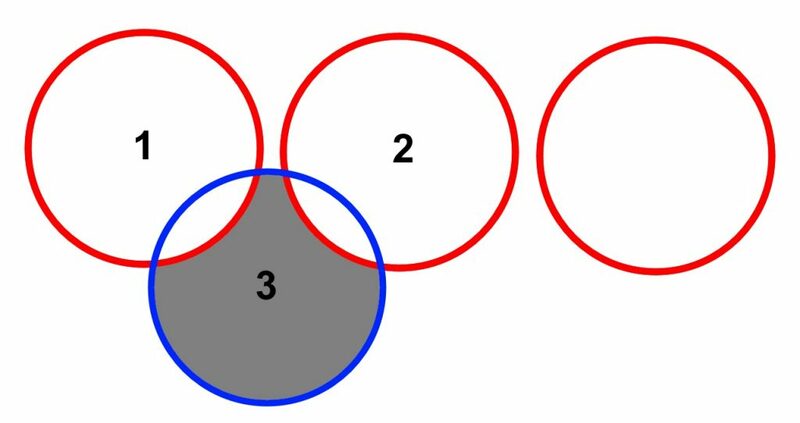 In some cases a coin may have 2 or more rim cuds. Rim cud errors are (relatively) common because the rim of the die is easily damaged in storage and transport. Cud errors can also occur in the main part of the coin design, usually these happen in weaker points of the coin design where part of the die breaks away because of excessive use. These cuds can be smaller and harder to spot, but they still form an interesting variety that some collectors are interested in. 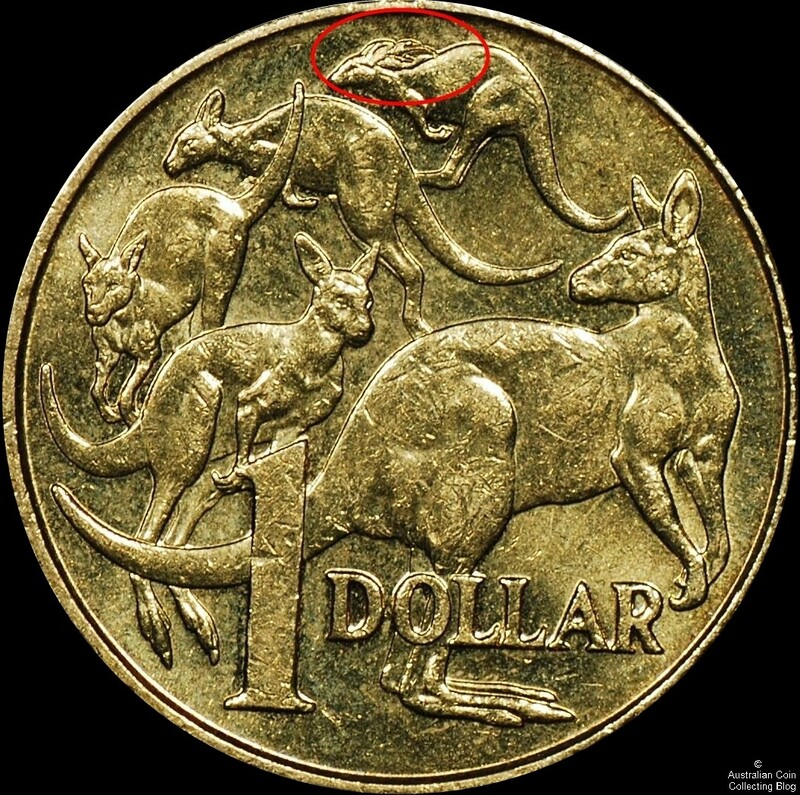 One of the best known cud errors of this type is found on the iconic Australian Mob of Roos dollar coin. Known as the Rabbit Ear Dollar you can see an example of this below. Sometimes when the cud is very large you can actually see the effect of the metal flowing to fill the cud as weakness on the opposite side of the coin. 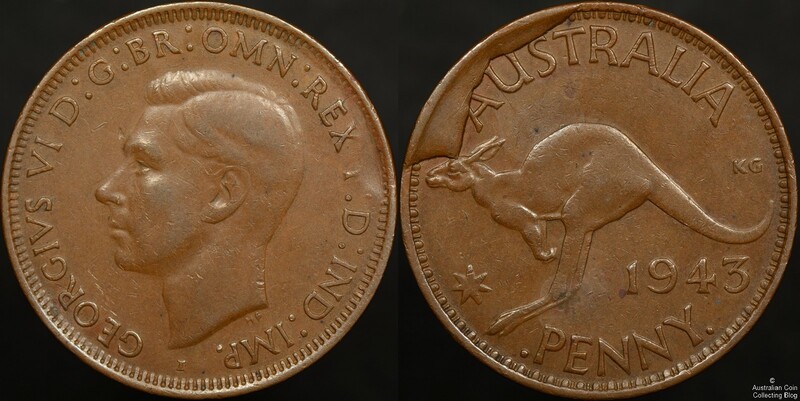 The 1943Y penny shown in the image below is a particularly fine example of this. The impressively large reverse cud has resulted in clearly visible strike weakness on the obverse with almost all of the letter F missing at about 3 o’clock in the legends.